While watching the builders next door do their thing, I became curious with their technique to install plywood on edges neighboring the next townhouse, and OSB for the rest (which for these narrow interior units is a single panel in the middle, but they use OSB all the way to the non-attached side on the end units). What's the reason to pick one over another? However, OSB, when cut, is more susceptible to water damage on the cut (the cut exposed raw wood not covered in the bonding agent/glue). Once OSB edges get wet, it expands like a sponge...which would ruin the roof. So, it looks like they might be using as much OSB as they can, but have to switch to ply whenever cutting. It could be that they are trying to slow down a fire from spreading. The material at the edges might be more fire resistant, so the fire will spread to adjacent buildings more slowly, allowing the occupants more time to escape. You might be able to verify this by checking the local fire codes for conjoined (not sure this is the right term) buildings. 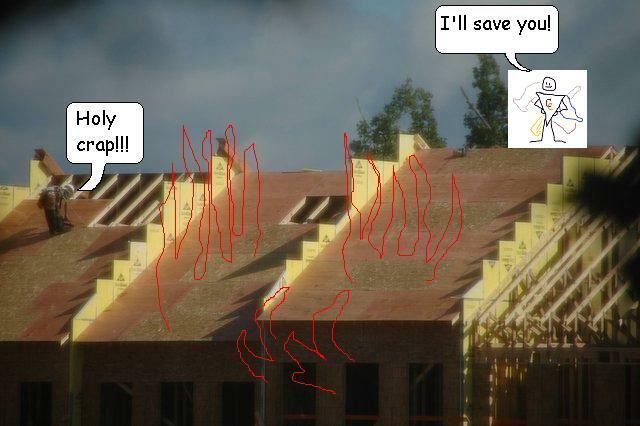 See how if there was an MS Paint fire, the flames would stay away from the next building (assuming the material in the middle burns faster). The man would then have more time to get to safety, or be saved by Captain Construction. Personally, I hate OSB for anything but temporary uses. It's not as strong as ply, it's more suceptible to moisture than ply, more easily damaged than ply. They use it for things like roofs and such cause it's cheap. They are counting on the roof being covered before any extended exposure to moisture, and they certainly don't expect constant foot traffic on it. When I had my own roof replaced, I specified ply, not OSB. But then, I'm biased. They're required by 2012 IRC to use a fire retardant treated plywood on the roof within 4' of the UL assembly (the firewall that's between each unit). They can use OSB in the middle as it's much more cost effective than plywood. Most likely the boards along the edge are a treated or coated sheathing product. Some common ones are "Blazeguard" or "Fireblock". In many areas earlier city codes called for gypsum board to be installed along the edges and these products provide the same fire blocking qualitites. The outer edges are fire treated plywood and have a reddish tint. Code requires a minimum of 4 feet from the fire wall. From seam to seam must be a minimum of 2 feet. So to reduce waste the stagger from 4 feet to 8 feet (full sheet). Anything in between fire treated wood can be plywood or OSB. The OSB these days has way better glues/resins than ten years ago. OSB, especially subfloor, holds up to moisture better than CDX. Advantech is one of the best and it is an OSB product! I wish people would get over their unbased biases and chill out! To reduce overall roofing cost, plywood panels are often used around the edges of a roof (near the eves) because this is where there is higher wind pressure pulling the nails out. 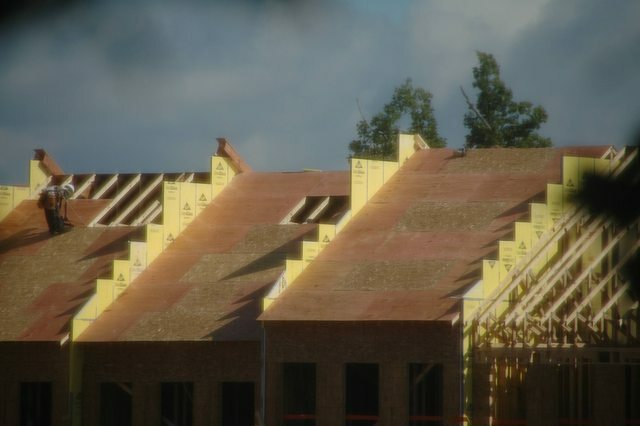 OSB is then used in the interior or field panels of a roof where wind is not as much of an issue. Plywood grasps the nails holding flashing, the finished roofing like asphalt shingles, or the like, better, especially long-term, than OSB which tends to soften more quickly with moisture cycles over the years. Although OSB was specified by the engineer in a cabin I built for a customer, because the location was very windy, I convinced the customer to upgrade the whole roof to plywood so that it would hold up better. ..Especially because it was a 2 to 3 story roof in places and steep, and thus hard to fix if something went wrong. I've had my own shed roof which was sheathed with particle board by the last guy fall apart as wind driven rain pushed moisture between the flashing and the felt. The moisture softened up the wood. The nails pulled out in a wind, and the whole thing needed to be replaced. I replaced the particle board decking with plywood. And I double flashed the edges so that wind driven rain can't push moisture in, even if the edge seal fails. I'm not sure of any difference at all - but I could swear I remember Mike Holmes saying that he liked OSB for roofs because it's stronger and a bit more resistant to water (more glue, I guess). If it were a matter of edge wicking of water and consequent swelling or crumbling, the photo would show only full, uncut OSB panels, but does not. Could it be, simply, that the roofing subcontractor was using new materials along with materials he already had on hand and wanted to get rid of? That would seem to indicate that it was leftover OSB that did not have an indoor space for storage, so needed to be used up or be lost to the weather. That theory is consistent with the OP pictorial, in that sheathing a roof would always start at a rake edge, or at interior, attached-unit-demarcating "wall" projections, and continue to an opposite edge, or inward, with interior sheets or partial sheets in between. Note: it is clear that structure comprises individually owned units--each prospective owner to be responsible for upkeep of his/her own roof (not the "common" roof). Each section is a roof unto itself, needing to be build only to residential (and therefore minimally specified) construction standards. Not the answer you're looking for? Browse other questions tagged roof materials plywood or ask your own question. How is installing roof sheathing horizontally stronger than vertically? How do I nail plywood to flat roof framing? Can you use plywood as roofing? Is plywood or dimensional lumber better for repairing notched joist? Roof Decking: Plywood/OSB over skip sheathing (decking) or should I strip to the rafters? How much weight will 1/8" plywood sustain for compression? What is the lifespan of plywood as roof decking? How to repair small area of damaged/loose plywood sheathe on roof? Is 1/2" plywood standard and appropriate for a roof replacement? What type of plywood for shower bench?